1br/1ba condo Sleeps 4, great pool! This charming one bedroom condo has a queen size bed in the Master and a queen sleeper sofa in the living area. It is located on the 2nd floor and has a balcony overlooking the pool. There is a TV in every room. The kitchen is fully stocked for the nights you may want to stay in and cook. 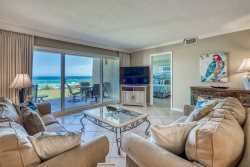 The beach walkover is only about a 3 minute walk from the condo. The condo has a washer and dryer.